Talk about setting the mood! These commercial grade decorative Bistro lights, also called string lights, will add a twinkling atmosphere to wherever you put them. 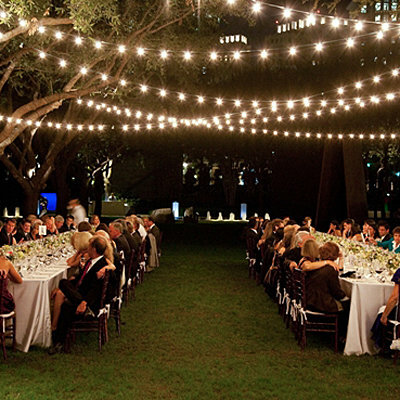 These lights aren't just for outdoors receptions, they look great in the barn, tents or even insidoors. The bulbs give off a soft worm-white light that's similar to candle light. You must choose comercial grade, weather resistant lights that Top Notch Rentals can provide for your outdoor use. We provide heavy duty 10' poles along with durable bases enableling us to fulfill the desired look at any location. On average, it takes 30 minutes to set up every 100 feet of lights. Question: Does the price include set up and take down of the lights? Question: Where do the lights hang from if we have no trees or buildings to go off of? Answer: Top Notch Rentals Provides 10 feet poles to hang the lights from. Question: Can you guys come a day early to set up the lights? Answer: Yes, infact we prefer to come the day before the event to ensure everything is safe and secure without being rushed. Question: How long does it take to set up the lights? Answer: We cant give an exact time because every loction is defferent on what we have to work with. On average it takes 30 min to set up every 100 feet of lights. Question: Do the lights come with a generator? Question: Where did you get the Bistro lights from? Answer: We purchased the lights through Costco.